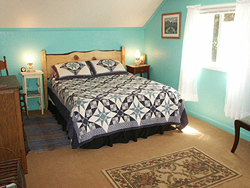 We invite you to be our guests for a stay at Kelly's Trout Creek Inn. The Inn is a delightful, colorful mix of Irish, Victorian, Country, Woodsy and Whimsical, relaxed yet elegant, casual and comfortable. The living room is always available for your relaxation. The Inn is a restored 1940's farmhouse with nicely furnished rooms. Marilyn's unique artwork is displayed throughout the hallways and living room, and is available for purchase. She creates very large botanical arrangements under glass. 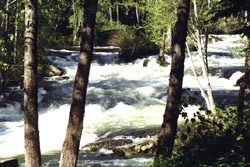 The Inn sits at the edge of the exuberant Trout Lake Creek, with its multitude of waterfalls cascading over the stairsteps of lava rock. Relaxing on the deck above the creek is a therapeutic experience. We've added a new top of the line HOT TUB — SPA overlooking the creek and waterfalls. With a fully roofed enclosure, (including glass windbreaks and a surround CD music system), you can be relaxing in hot water no matter what the weather is doing! There is no gift quite like presenting loved ones a relaxing get-away. Call for details on our Gift Certificates. 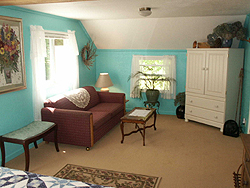 Three different, unique, and charming rooms are available at Kelly's for your sleeping comfort. The "LILAC Room" is on the main floor and features lilac wallpaper with relaxed green trim and black accents. This room has a comfortable full-size bed, lace curtains on the creekside view windows, and comes with it's own private full bathroom. 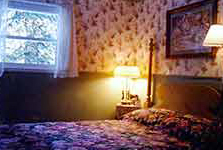 The LILAC Room is $75 per night. The "CAMELOT Room" is upstairs, featuring 2 full-size beds, and it's own private half bath for additional privacy. 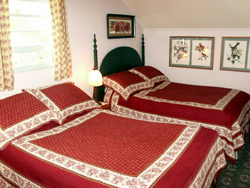 This room is an English style room, with old fashioned red patterned quilts. The CAMELOT Room is $85 per night. Also upstairs is the "CREEKSIDE Suite," a large and spacious room with excellent views of the creek and waterfalls. This room is bright turquoise with rustic wood accents and sheer white curtains. The CREEKSIDE Suite features a queen-size bed and hide-a-bed sofa for children or an extra guest. This suite is $100 per night. The CREEKSIDE Suite has it's own private deck-balcony overlooking the creek and waterfalls, with a spiral staircase down to the yard (great for access to the outdoor HOT TUB — SPA). Our 2 upstairs rooms share the deep, antique clawfoot tub/shower in the upstairs master bathroom. Children are also welcome at Kelly's with advance notice. We'd love to see you. Come on out to visit - and explore the land of the "Forgotten Giant." 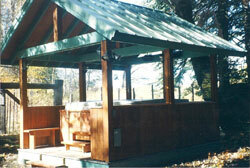 Hot-Tub Spa adjacent to creek & waterfalls. 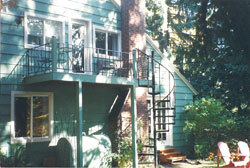 Private deck-balcony with CREEKSIDE Suite. We accept personal checks, cash, Visa, MasterCard or Discover. We have a 2 night minimum stay policy for weekends June through mid-September. Our cancellation policy applies for June through mid-September, and is a 7 day policy.